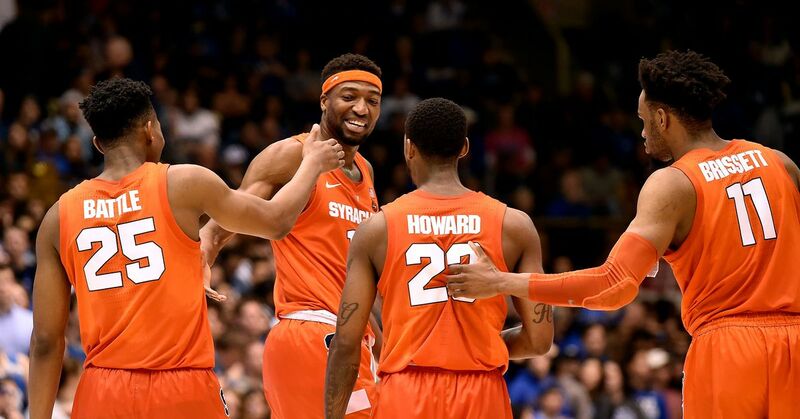 The Syracuse Orange weren't the only ones to benefit from their 95-91 victory over the top-ranked Duke Blue Devils on Monday. Before the game, business owner and Syracuse fan Adam Weitsman said on Twitter he would donate $150,000 to the Boys & Girls Club if Syracuse won the game, and he more than delivered on his promise. I also want to make sure our local #Endicott Boys Club is supported and not forgotten, so I want to give them $25,000 to use for their programming for their kids, in addition to the donations heading to Owego, Binghamton and Syracuse facilities. Go🍊! Myron Medcalf of ESPN.com reported Weitsman donated $50,000 each to Boys & Girls Clubs in Owego, Binghamton and Syracuse, as well as an additional $25,000 to one in Endicott after his friends reminded him of the fourth one, which brought his total to $175,000. Medcalf noted Weitsman had lunch with Syracuse head coach Jim Boeheim prior to the game and told him of the promise. According to Medcalf, the philanthropist spent nearly a year in prison in 2004 due to felony bank fraud but has since established himself as the owner of Upstate Shredding. The Boys & Girls Clubs can thank Weitsman and a balanced Syracuse attack that featured five players in double figures for the donations. Tyus Battle led the way with 32 points, four rebounds and four assists, while Elijah Hughes added 20 points and five rebounds in the upset win.